Editor’s Note: Seasoned Outlaw 8.5 and 275 Drag Radial racer DJ Reid is documenting the build of a new LSX engine for his ’68 supercharged Camaro. DJ will be sharing not only from his vast experience in engine development but also talking to numerous experts as he selects and matches the components. Following is a story on the induction system with additional stories covering piston sealing and other engine assembly topics to follow. As mentioned in this series first article, “Steppin’ It Up,” the West Coast 275 drag radial ranks are promising a tough 2014 racing season. To keep pace with big names like Artis Houston, Armen Maghdessian and Eric Gustafson, our 275 racing team needed to seriously evaluate the Camaro’s next powerplant. Several key areas determine the soul of any engine build, including the head and valvetrain selection. We started with Comp Cams’ new Elite Race series valve train components, Ferrea’s custom valves and then the crème de la crème, Mast Motorsports‘ massive CNC-machined Mozez heads and matching CNC’d tunnel-ram intake manifold. A side by side visual comparison of the Mast Mozez head and tunnel ram (left) compared to the Brodix 15-degree head and single plane manifold raced last season. The Mozez head sports 10-degree intake and 7-degree exhaust valve angles while the Brodix head has 15-degree valve angles. Before deciding on the heads and valvetrain, however, we established the platform and power adder. We are partial to the instant horsepower and torque of our 105mm Vortech XB105, so staying with the supercharger was a no brainer. From there, rules and weight guidelines made a small-block mandatory. Finally, we wanted to keep it in the Chevy family. That left two choices: a Gen 1 small-block or the promising but unfamiliar LSX. As we consulted industry notables, such as Dart’s Richard Maskin and Pettis Performance’s Jason Pettis, it quickly became clear that most aftermarket performance trends pointed toward the LSX engine line. Quick views of the Mozez cylinder head and inside and out. The intake and exhaust ports (left) are massive and flow numbers large enough to rival even respectable big-block heads. A view of the port entry into the combustion chamber (right). Pettis is an ideal source to help determine the optimum top-end components capable of supporting our 1,800 horsepower goal. He cut his teeth installing centrifugal superchargers on small-blocks and traditional Hemis, and by building and tuning engines for multi-record holder Doug Sikora. Those discussions led to Chris Durrett at Mast Motorsports in Nacogdoches, Texas. In addition to offering engine building and machine shop services, Mast produces high quality LS heads and intake manifolds for both street and strip use. The Mozez head manages big-block flow numbers in a small-block package. At 458 cfm, the new combo dwarfs the former setup that peaked at a respectable 372 cfm. What does a maximum effort 275 cylinder head look like? Durrett suggested the Mozez cylinder head, a CNC’d raised-runner race casting. This head sports a .750-inch thick deck to withstand the cylinder pressures of nitrous, supercharger and turbocharger applications. The combustion chambers are larger than the traditional 50cc to give the builder more flexibility in compression ratio and piston design — an option often critical when adding boost. Finally, the Mozez is a canted-valve head, boasting a 10-degree intake with a 4-degree cant and a 7-degree exhaust with 2.5-degree cant. The combustion chambers measure 50cc when fitted with the Ferrea valves. With a flat-top piston, the final compression ratio should end up around 10.8:1. Contrary to a standard inline head where the valves are parallel to each other, a canted head angles the valves away from their respective cylinder wall and points them towards the center of the bore. In addition to reducing the shrouding effect, canting the valves allows the head to accommodate a large valve without running into cylinder wall interference. The net effect is a larger, more efficient air passage to the cylinder. The Mozez head features a 2.250-inch intake valve, 1.600-inch exhaust valve and 355cc intake runner. Mast says the head flows 458 cfm on the intake and 281 cfm on the exhaust, both at .900-inch lift. A view of the valve angles as cut into the head directly from Mast. On the intake side, a .050 margin break edge, 55-degree seat at .060 wide, 45-degree first back cut at .060 wide/32 degree second back cut at .080 wide and 12-degree back angle. On the exhaust side, a .080 margin radius edge, 55-degree seat at .060 wide and 25-degree back angle. The chamber design helps avoid any aggressive change in direction as the air-fuel mixture flows past the intake valve. A 60mm cam core compared with a stock LS cam. Beyond the transition from the valve seat to the chamber, the head was ready to rock out of the box. The chamber and bowls didn’t require the hand blending that many heads need prior to final assembly. On a side note, if your class rules don’t allow a canted-valve head, Mast offers a PXR race head. It’s an inline, 12-degree, 6-bolt race head design sporting 2.220/1.600 valves, a 290cc intake port and is milled to accept T&D, Jesel and Mast rockers. Peak intake flow is 415 cfm at .900 lift. Pettis Performance uses Audie Technologies’ Cam Pro Plus to verify camshaft specifications and measure theoretical lifter velocity. Valvetrain: Stuffing a race ready cylinder head. A good set of heads alone is not enough to make high horsepower. A key characteristic of any high-power small-block is rpm, and a stout valvetrain is necessary to manage those revs. “I would like to see us shift at a minimum of 9,000 – 9,300 rpm,” says Pettis. For the camshaft we consulted with Chris Padgitt from Comp Cams, who has over a decade in camshaft design experience and has worked with Pettis Performance on many previous performance builds. Both agreed on a 60mm custom-cut billet roller with almost an inch of lift and nearly 300 degrees duration at .050. When the cam arrived at the shop, Pettis used Audie Technologies’ Cam Pro Plus system to measure and verify the accuracy of the cam lobes. The system also provides information about the lobes, such as lifter velocity and acceleration. For this type of high-rpm build, we knew calculating component velocities would be critical in selecting hardware that would resist failure. The Pro Plus system also helped determine optimal piston valve-pocket depth, knowing that the closest interference would occur at 10-degree ATDC for the intake and 10-degree BTDC for the exhaust. 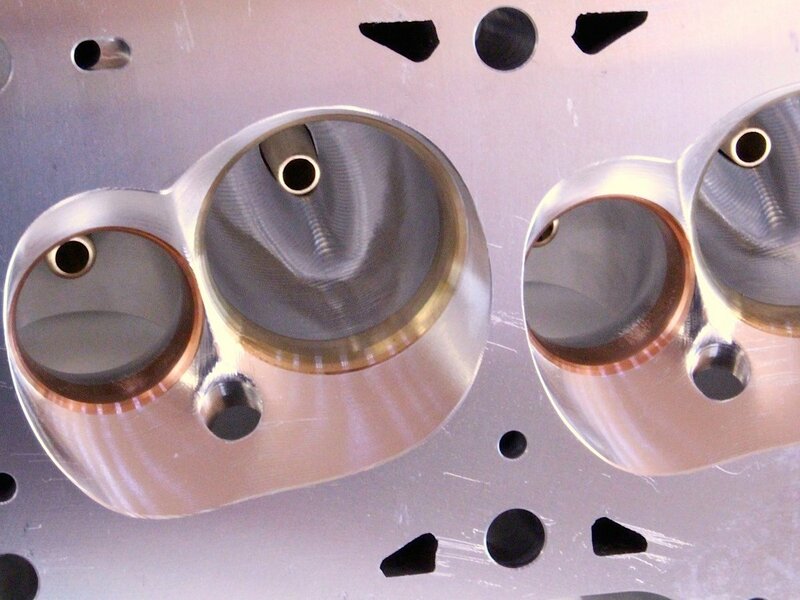 Pettis than passed along these critical measurements to Ross Pistons to ensure proper piston design. Comp Cams new Elite Race lifters (part 98835CR). They feature a .903 body diameter and .820 wheel diameter. A unique to these lifters are exchangeable cups for varying pushrod offsets. “Cam-lobe geometry can be calculated with commonly available info from the master lobe catalog, but when we have the cam in hand we take the measurements to verify our calculations,” says Pettis. Knowing the valve drop was especially important because we wanted the flattest piston top possible, a motive we’ll get to in another story. Finally, we used the software to measure all 16 lobes to verify the overall accuracy of the camshaft. These are the little details that many builders opt to skip but they can make the difference in an induction-limited build where every last ounce of engine efficiency and power counts. Ferrea 2.250 intake valve and 1.600 exhaust valves. The titanium intake valves are flat on the face for strength while the heavier stainless exhaust valves feature a bowl cut for weight savings. For valves we discussed our needs with Zeke Urrutia at Ferrea and settled on 1.600-inch stainless-steel exhaust valves and 2.250-inch titanium intake valves. The exhaust valves are dished to save weight while titanium itself is the ultimate weight saver. The intake valves are flat face, as Ferrea doesn’t believe the weight reduction could compromise strength. To control the valves at nearly one-inch lift and 9,500 rpm, Comp Cams suggested its Elite Drag Race spring (PN 26957), which bolstered a 430-pound installed rate. Normally, we would have gone with a 1.670-inch triple spring in this type of application. However, Comp’s new technology provides enough pressure in a smaller 1.520-inch dual-spring package. It has a much taller free length than the traditional 1.670-inch spring, allowing for increased stored energy when in compression to react faster and resist coil surge. Intake (right) and an exhaust (left) valves from Ferrea. It is common to use a three angle profile on the intake and only a single angle profile on the exhaust side. The profile used on a valve has a significant influence on cylinder head performance. Lifter selection can get tricky, as the Mast head’s generous flow comes with some compromise. We had to play around with offsets to maintain the proper geometry for a high-rpm race environment. Comp’s new Elite series lifter features a .904-inch SAE 8620 steel alloy body that is CNC-machined and REM-finished. It comes with an .820-inch SAE 9310 steel alloy wheel that’s micro-polished and 52100 bearing steel needles. The lifters have removable cups so that the offset of each lifter is determined at the time of the build, rather than guessing and shipping test sets back and forth before achieving the proper alignment. For this build we selected a centered cup for the exhaust and a .180-inch left offset for the intake. The free length difference from a normal 1.670 triple spring (right) and the 1.520 double (left). Comp’s 1.520 double has a much taller free length which increases stored energy when compressed. This increased stored energy helps the spring react faster while resisting coil surge. The Comp double is almost 48 grams lighter than a comparable triple. For rocker gear, we went with one of the most familiar names in the industry. T&D Machine Products specializes in shaft-mount rockers designed specifically for high-endurance race applications. We consulted with Phil Elliot and designer Sheldon Miller, who sent a custom set of rockers based on T&D standard Mozez design but with a few enhancements to address the aggressive cam profile and other modifications to be discussed later. While it was clear we’d use a steel rocker, at the time of this writing we were still closing in on some of the final details with T&D. We’ll cover the final outcome as well as Trend’s pushrod offering when assembling the top end. The matching cast tunnel ram from Mast is massive. It comes out of the box with pre-machined injector bungs, 12AN fuel rails, and fogger nozzle bosses. As an added treat, the inside is 100 percent CNC machined from top to bottom. Some cylinder head manufacturers may leave it up to engine builder to figure out an intake package. Often this leads to a custom and expensive sheet-metal tunnel ram. Fortunately, Mast builds two intake selections for the Mozez package. We first considered its 4500 top, single-plane manifold for simplicity and engine bay packaging; but what fun would that be? What we ended up with was a monster, a Mast cast tunnel-ram that is big enough that we could stuffed a soda can down the runners. The manifold has a large plenum that should help eliminate air distribution problems commonly found in a single plane manifold. The build will also sport 235lb/hr MRE Billet Atomizer injectors. This manifold features 5.250-inch length tapered runners that came port matched to the Mozez heads, massive -12 AN injector rails and cast provisions for our Moran 235 billet injectors. The manifold is fully CNC machined, comes with O-ring provisions and has raised bosses for nitrous fogger nozzles. But this manifold hardly appears cast. The Mast machining operations completely radius every runner transition and smooth out the entire plenum. Like the heads, this manifold was ready to run out of the box. While the manifold was well thought out, Mast suggested that the top be designed for our specific engine and car. We turned to Bryan Neelen at Late Model Engines, who recalled a similar application as a starting point. “We had a high-boost, twin-turbo build that needed a lower profile manifold to fit the existing cowl but wouldn’t sacrifice the distribution of air to the cylinders,” remembers Neelen. From there, he loaded up his Master Cam software, an 18.25 x 9.00 x 3.25-inch piece of 6061 billet and got to work. What resulted was a fully machined billet top with a custom 5-inch tubular flange capable of accepting a number of different tube or throttle body options. The intake did require some modification to accommodate the large inlet, which is situated in the top portion of the manifold plenum and bisected so that half sat in the manifold and half sat in the top. To do this, Neelen had to build a custom jig on his CNC to hold and then machine a semi-circle into the manifold based. What resulted was a stunning low profile billet top that doesn’t sacrifice the manifold’s ability to distribute air. LME's billet manifold top completed and then installed on Mast's tunnel ram. With the help of an all-star lineup like Pettis Performance, Mast Motorsports, Comp, LME, T&D and Ferrea, this build has started out with a real bang. As we get closer to completing this build, all of the components these companies helped us choose will dictate the components list going forward. From the rear gear ratio to the type of block, our decisions will continue to hinge around our ultimate induction package as we continue our quest for radial 275 competition. DJ has been involved in door slammer drag racing for more than a decade and a half. As a Silicon Valley insider, his interests and expertise are focused on the software technology that powers fuel injection, data acquisition and ignition control. His race team is based in Northern California but travels from coast to coast. DJ’s current operation revolves around a leaf sprung, blown and LS-inspired 1968 Camaro that he uses as a test bed for emerging technologies with various manufacturers. He is a vocal member of the racing community and uses his industry relationships to share findings and new innovations with that community.